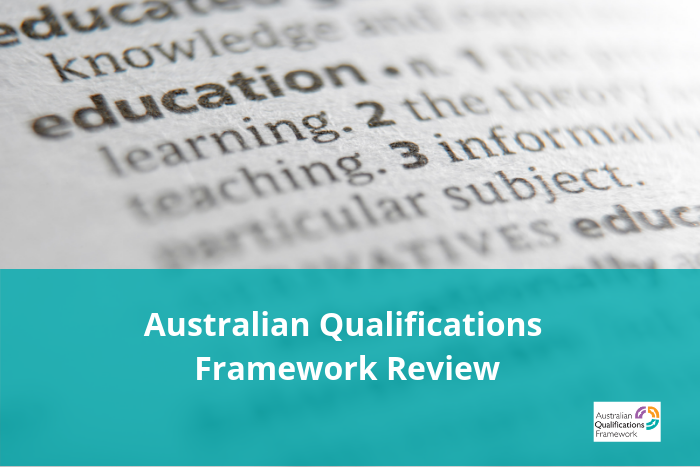 The Australian Qualifications Framework (AQF) is the national policy for regulated qualifications in Australian education and training. In the 2017-18 budget, the Australian Government announced a review of the AQF, which will ensure that the framework continues to meet the needs of students, employers, education providers and the wider community. The AQF was last reviewed between 2009–2011. Since then there have been technological advances in education delivery, increased uptake of sub-qualifications and changes to international practice related to qualifications frameworks. Ms Marie Persson, Member, New South Wales Skills Board, Chair, NSW Skills Board Industry Reference Group, Member, Monash Commission. The Minister for Education and Training, and the Council of Australian Governments Education and Industry and Skills Councils, have approved the Terms of Reference for the review. The review will involve consultation in response to a discussion paper. Stakeholder consultations are planned for February 2019 and the review’s final report will be provided to government by September 2019. The department contracted PhillipsKPA to provide contextual research for the review, related to international qualifications frameworks and domestic use of the AQF. In mid-2018 the department contracted Ithaca Group to investigate credit pathways in VET and Higher Education, to help inform the Review. Further information on the consultation process will be released as it becomes available. Inquiries about the AQF Review can be made to AQFReview@education.gov.au. Public submissions are now open and must be received by 15 March 2019. All interested parties are encouraged to make a submission using the submission form. Submissions can be sent to AQFReview@education.gov.au.